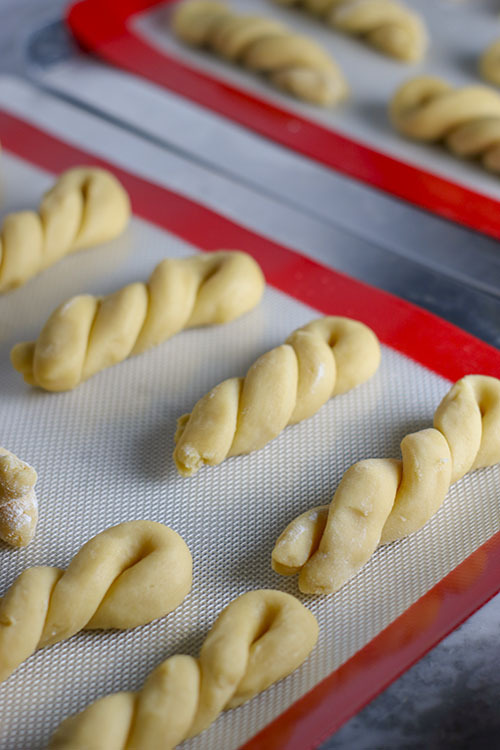 Koulouraki – pronounced koo-loo-RAH-kee-ah. 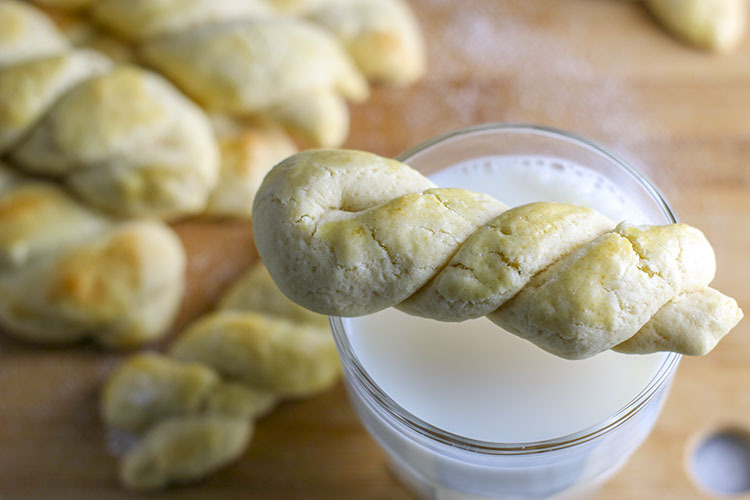 Also known as, Greek Butter Cookies or Greek Easter Cookies. 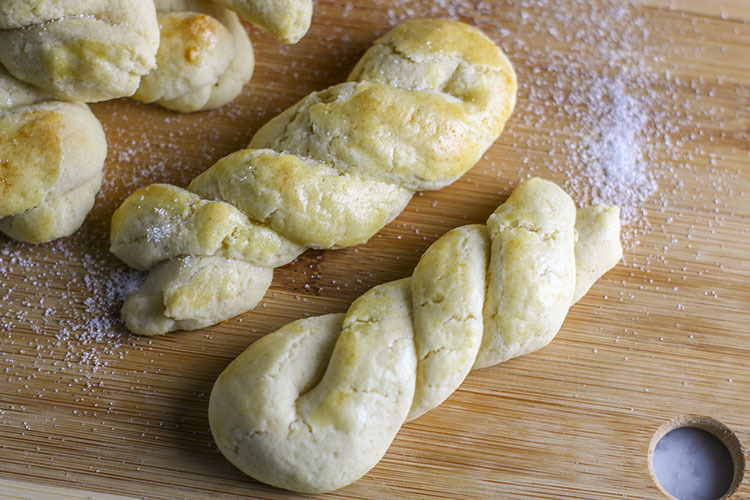 I know what you’re thinking… first Hamantaschen now Koulourakia? 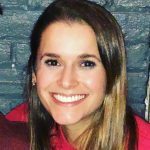 Where do these crazy names come from? Well, naturally, they come from the two largest groups of crazy food loving people – the Jews and the Greeks! Its true – I am not Greek! Its all Greek to me! Ha, ha, get it? I have a best friend named Hypatia – she is actually not Greek either. But her name is Greek. I do love Greek food. But who doesn’t? 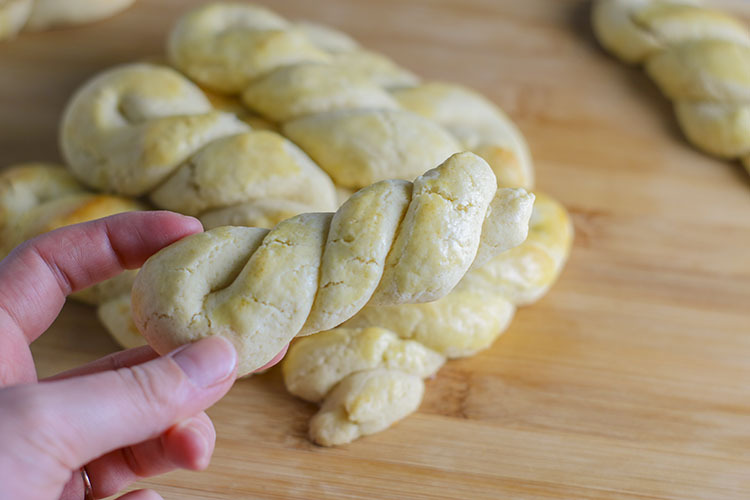 So why am I making Koulourakia? Here in Columbus, Jake and I have two incredible friends – Mike and Ginny. Without them, we would be lost. With them – we have lives because they actually like us! Crazy, I know. Mike’s mom’s family is Greek – HAZZAH! How’s that for a long-winded connection? Ginny invited us over to a dinner where she was going to make us a fun recipe from Mike’s family cookbook – HOW FUN! So, being the food-obsessed, lover of baking that I am – I decided I must contribute to the fun! I wanted to make a Greek dessert that was fun and easy, but still tasty. 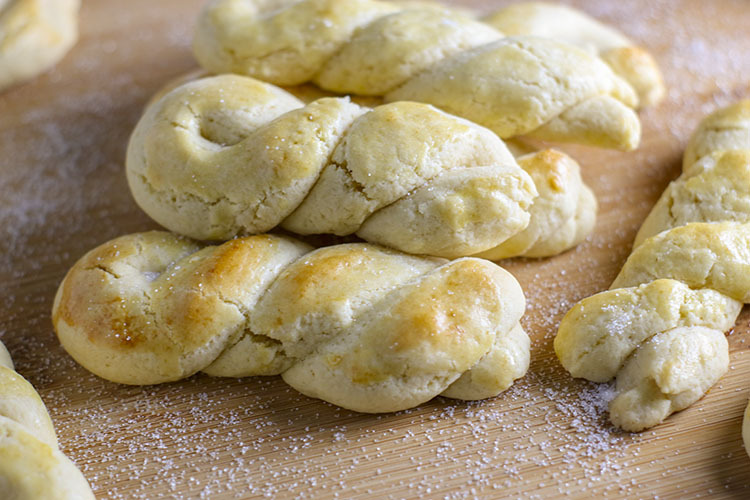 Koulourakia – a sweet butter cookie, often made with orange zest or orange juice – moist, dense and melt-in-your-mouth delicious. Naturally, this recipe is not in my wheelhouse of known and loved recipes! And honestly, I was not even sure what the end result was supposed to taste like! But it sounded good – so c’est la vie. 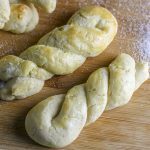 I did quite a bit of research, comparing recipes, in order to determine what ingredients were most often used to make Koulourakia. All the recipes I compared seemed to have the same base – butter, sugar, eggs, and flour. Where the recipes seemed to differ was regarding flavoring and final touches: the inclusion of citrus (orange or lemon juice/zest), and the use of topping (egg wash, sesame seeds, and/or nuts). After looking through quite a few recipes, I decided to adapt a recipe by Heather Christo because it was easy, straight forward and did not include any orange juice or zest. Now, I have no idea how Koulourakia are traditionally made. But I don’t love citrus in my cookies! So, I decided wasn’t gonna put no citrus in my cookies! Badda bing badda boom. I did choose to add some almond extract for some added flavor and I eliminated just a touch of flour! I did follow Heather’s suggestion to use an egg wash so that the cookies would brown beautifully in the oven – and taste even more delicious! So how’d they turn out? 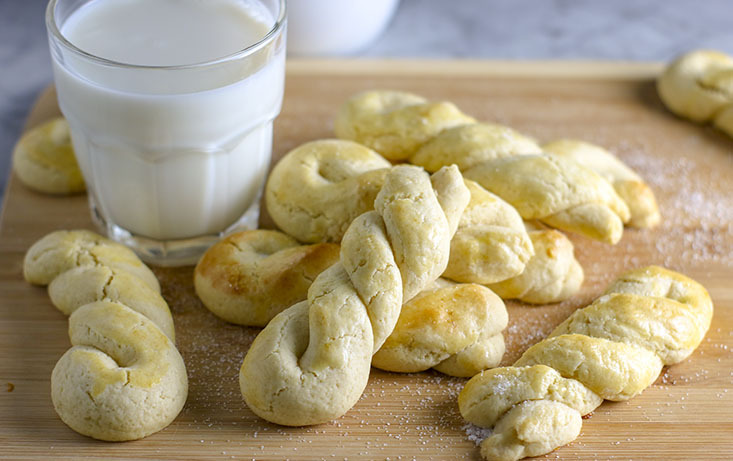 Whether you are Greek, or not even close to Greek (like me), I promise you will enjoy these incredibly delicious, easy, and adorable butter cookies. 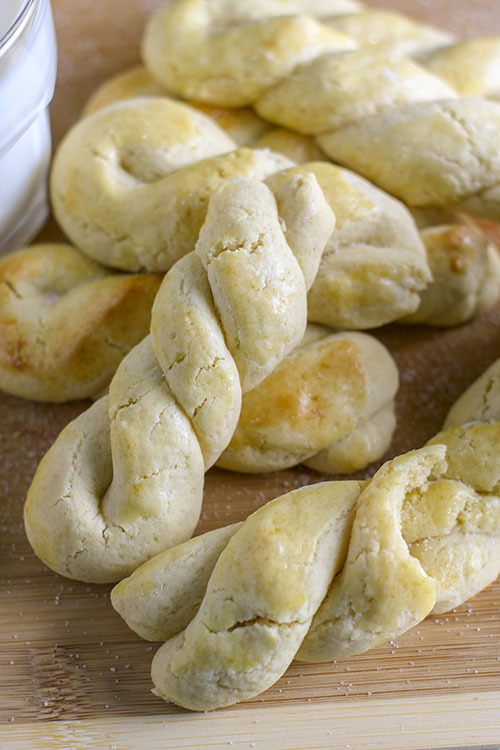 Sweet, dense, braided Greek butter cookies, perfect with a cup of coffee or tea! These melt-in-your-mouth sweet vanilla almond morsels are incredibly easy to make and even more delicious to eat! One Koulourakia will just not be enough! Original recipe by Heather Christo. Preheat oven to 350F. Line a sheet pan with parchment paper or a baking mat, set aside. In the bowl of a mixer, cream butter and sugar. Add vanilla and eggs - continue to beat until fluffy. Add dry ingredients slowly to bowl of mixer, mixing on low. Move dough from bowl to a lightly floured surface. Knead with clean hands for a few minutes until dough is smooth. 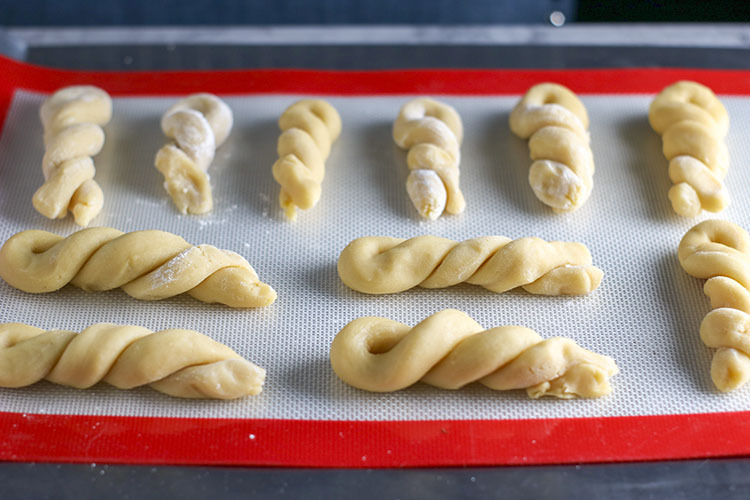 Take 1-2 tablespoons at a time, roll into a worm shape, then twist the two ends together and place on the lined sheet pan. Once all cookies have been formed, beat remaining egg and milk together. Use a pastry brush to brush egg was over tops of cookies. Bake at 350F for about 15-20 minutes, or until golden brown. Allow cookies to cool on a wire rack. Serve with coffee, milk or tea! Storage: Once cooled completely, store in airtight container for up to 3 weeks. NOTE: This recipe was adapted from a recipe by Heather Christo.